This most beautiful of stone circles at Duloe must surely be unique in that it is wholly composed of quartz stones. 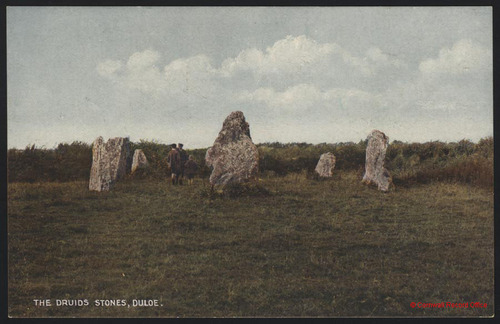 Lukis and Borlase1 described the circle as "a remarkable monument, on account of the great size of its stones. It is situated in a grass-field, close to the village of Duloe, and is 36 feet 6 inches in diameter. Seven stones are erect and one is prostrate. They are placed at distances of from 8 to 12 feet apart, and are all blocks of quartz; the highest stone is 8 feet 8 inches high, and 7 feet 6 inches in greatest width. The lowest is three feet. The fallen stone, the largest of the circle, has been artificially split into two parts, and is partially buried in a pit, which appears to have been excavated when it was thrown down for the purpose of converting it into building materials or gate-posts. The ground on which the monument stands is level. The monument is so small and differs so much in character from all other circles, that it is probably the enclosing ring of a cairn which has been entirely removed." Image courtesy of and © Cornwall Record Office. George Tregelles wrote in the Victoria County History of Cornwall2 that a hedge bisecting the circle was removed in 1858, and that three of the huge blocks of quartz were re-erected about the year 1861. A Bronze Age Trevisker urn containing human bones was discovered at a depth of 3 feet whilst attempting to raise the broken stone, which can be seen at the front of the circle in this view by A E Raddy of East Looe. 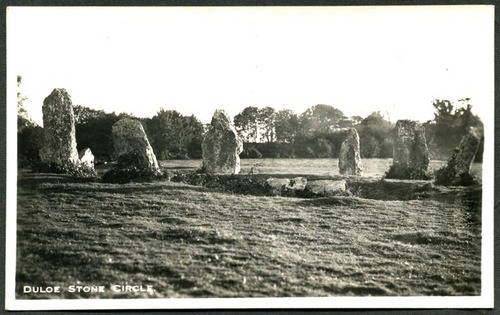 Another real photographic postcard by Raddy showing a view of the smallest stone circle in the county. 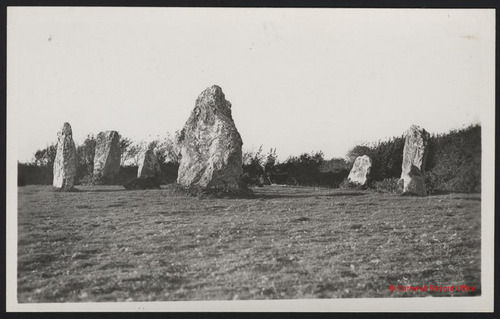 John Barnatt wrote, in 1989,3 that "This irregular circle has stones of variable size which appear to be designed to have alternating large, bulkier stones, and small ones, with the larger ones at approximate cardinal points. The site was first noted in 1801 and partially restored in 1861 or 1863. A wall that ran through the site was removed. There is some confusion what else was done at this time, but the most likely interpretation of old accounts is that two of the stones were discovered upright, previously hidden in the wall and that only the northernmost stone was recumbent. Attempts to re-erect this failed as a portion of its base broke. This lay by the stone until after 1902 but has now vanished." Image courtesy of and © Cornwall Record Office. 1. Lukis, W C and Borlase, W C. 1885. Prehistoric Stone Monuments of the British Isles: Volume 1, Cornwall. Society of Antiquaries. 2. Tregelles, G F. 1906. 'The Stone Circles'. Victoria County History of Cornwall 1, p379-406. 3. Barnatt, John. 1989. Stone Circles of Britain: Taxonomic and Distributional Analyses and a Catalogue of Sites in England, Scotland and Wales (2 vols). British Archaeological Report (British Series) 215.